Libby currently works as a Mentor within the States of Jersey’s Education department. Much of her spare time is devoted to sport; either playing football for local club side JTC Jersey Wanderers or netball for St Lawrence NC. Libby discovered her passion for coaching whilst studying at the University of Bath, and has since been actively involved in the ever expanding and developing Jersey FA Womens & Girls Player Development Centre, where she has been involved for a number of years and currently works with the U14 representative side. 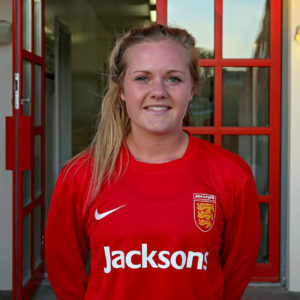 Libby has also been capped a number of times for the Jersey FA senior womens team and was part of the successful Island Games Gold medal winning side in 2015. She has a real and natural passion for local and international development through the power of sport, particularly football and considered many of the objectives of J2A to be synergistic with her own.